I was going to post this last night but R and I had too much fun watching the Red Sox game at a local sports bar. He now has Fridays off and I have some PTO to take so I decided to today off and spend some time with him. I'm going to try to follow a blog "schedule" with a theme for each day of the week. Thursday is my "home" related day so I wanted to share a small project that R and I completed that made such a big difference in how much I enjoy our dining room. We reupholstered our dining room chairs. I couldn't find a before picture of a chair (without someone sitting in it) but think plain tan tweed. It was a basic "go with anything" look but I really wanted some color. We are still in a rental house and our walls are mostly white, except in the dining room where there is odd, red dragon fly print wallpaper underneath the chair rail. It's a faded coral color, red enough that it looks okay with the wallpaper in the room but much softer. I finished the project with two complete coats of scotch guard fabric protectant. 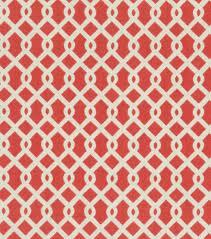 I purchased too much fabric so I'm going to use the rest to make some cafe curtains for my kitchen - I love this pattern and I think the color could brighten up that room as well.